Inspection & measurement | SCREEN Holdings Co., Ltd.
We hope to contribute to our customers’ ability to create well-made products. With this in mind, we have continued to fully develop our core technologies* and sought to actively utilize open innovation to provide new solutions that support our customers’ manufacturing capabilities. This also connects to our goal of becoming an enterprise that can contribute to society on a global scale. As we move forward, the SCREEN Group will remain committed to using our business activities to resolve the many challenges facing society and to creating a sustainable future. 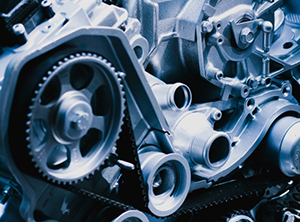 Metal components are used in critical core systems related to the safety of vehicle engines and brakes. Previously, all of these components usually required visual inspection by human operators due to their widely differing and highly complex surface conditions and shapes. The SCREEN Group is working to accelerate our growth in the inspection and measurement field by leveraging our proprietary optical and image processing technologies. Our goal is to change the de facto standard for this field from human to fully automated visual inspection. SCREEN is involved in the development and sale of automated visual inspection systems that are able to evaluate in-vehicle metal components as well as detect incorrect or missing parts in assembled components.